Jackets There are 177 products. Style : Jacket SHOW Be feminine with a asymétrique? Of course it's possible with this smooth leather jacket that fits your curves and highlights your waist with its adjustable belt. Style : Jacket PLEASE You like the rock look and you want to keep it also during the winter? Then you'll love this style in aged nubuck which combine these two criteria to perfection! Its belt shows your waist and adds a fashion detail to be noticed! 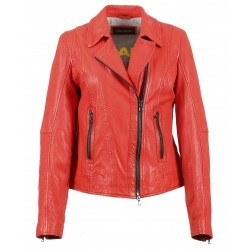 Style : Jacket GIGI Shop this leather biker jacket which is very trendy this season. 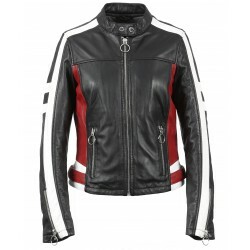 We love the white sporty stripes on the jacket. Wear it with skinny jeans and leather ankle botts and your outfit will be perfect! Style : Jacket FIDJI Choose light colors for this mid-season. We always need colorful clothes to enlighten our days during Spring time! Style : Jacket MELINA For a minimalist inspired look, shop this asymmetricam leather jacket. Neutral and very fitted, this jacket will accentuate unpretensiously your feminity! Also try it with more sophisticated piece to elevate the all outfit. Style : Jacket GRACE Shop this leather biker jacket which is very trendy this season. 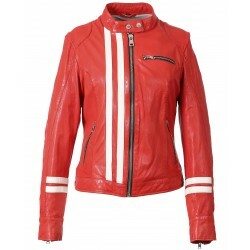 We love the white sporty stripes on the jacket. Wear it with skinny jeans and leather ankle botts and your outfit will be perfect! Style :Jacket VIDEO Centrepiece of your wardrobe, this asymmetrical jacket will give you a modern and sophisticated look. 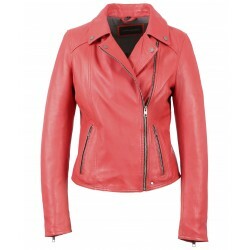 Rock, biker or femme fatale you can style this must-have leather jacket however you want! 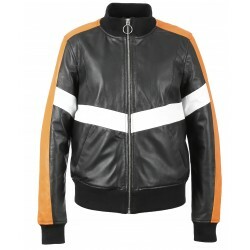 Style : Jacket CLUBBER We bet you won't stay under the radar with this sport color block leather jacket! Bring a graphic and sporty touch to your look with the white and orange bands. The tone-on-tone seam on chest is a plus because the pockets are discreetly hidden! Style : Jacket CITY New member to the OAKWOOD family! This very trendy fitted jacket will unlock your feminity power, We love its asymmetrical zip, tone-on-tone pressed buttons.Wear it with a dress or with a pair of jeans. We are sure it will become your new wardrobe essential.